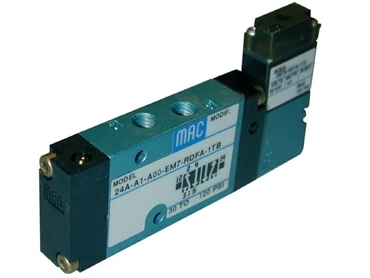 Pneutech’s solenoid valve range now includes the series 24 MAC Solenoid Valve. Solenoid valves that don’t stick; with high flow, fast response, long life, and precise repeatability. Pneutech are pleased to announce the release and availability of the new 24 Series solenoid valve. These 24 Series solenoid valves incorporate a 10mm solenoid pilot operated 4 way valve. This valve utilises a new 3 way pilot which is poPneutechred by the existing "R" type solenoid that is currently used on the 33, 43, 83 and the plug-in version of the ISO-01 and ISO-02 valves. An air only return version (standard - minimum operating pressure of 25psi) and a spring return version (optional - minimum operating pressure of 35 psi) are available. This initial release of the 24 Series Solenoid Valves is the non plug-in version available as an inline and base mount body.